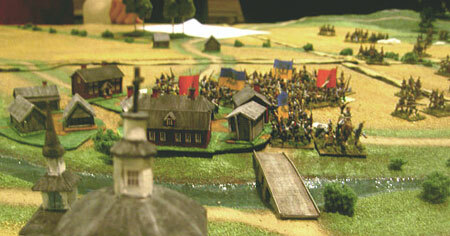 On these pages we describe how to recreate some of the battles of the Russo-Swedish war of 1808-09 in miniature. Gemigabok members have long toyed with the idea of doing something miniature wargaming related with the war of 1808 especially because of the local aspects and all. The realization of the approaching 200th anniversary of the war was the final catalyst. In 2005 and 2006 we organised participatory games at Ropecon of the battles listed on these pages. At this stage most of the material concerns the Finnish and Swedish armies, and recreating them in miniature, as there is a wealth of material available online on the Russian armies. 1. To be able to do refights of several 1808 battles and instead of doing them as just one offs what would be grander than playing these refights on the exact dates of the battles during the 200th anniversary in 2008? Instead of making the terrain from generic terrain pieces each of the battles will have a custom built terrain trying to capture the landscape as exactly as possible but still keeping in mind the playability and durability because of the need for the pieces to be transported every now and then. 2. To pass on information about the war and all its aspects to fellow wargamers around the globe. This information is not that easy to find even in swedish or finnish let alone in other languages. 3. To promote historical miniature gaming locally. If anything is known about miniature gaming in Finland it is only about “warhammers”. We hope to utilize the 200th anniversary of the war and the publicity it’ll naturally get to promote the historical side of miniature gaming hobby. In addition to this “education” of general populace the same is done in more depth in the gaming community with participation games in local gaming conventions.